I agreed with the Democratic the most with 70%. I'm surprised I agreed with the conservative party at 57% because I tend to lean towards pro-choice and freedom in decision making. Libertarians at 30% because I believe people should have the freedom to make whatever choice they believe is right for them. This small percentage struck me by surprise -- I thought I would have scored higher. 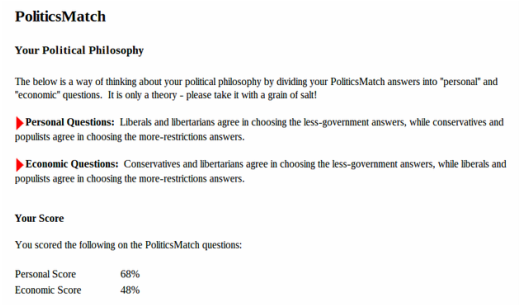 I agreed with left liberal and libertarian the most. Social score is 68% and economic score is 48%. I was not surprised because I support freedom and pro-choices, so the category that I fell under fit me best. Yes, because it supports self-decisions and is open and welcoming. It supports new ideas and new changes, so I agree with my top match candidate's stances. "Strongly opposing" the absolute right to gun ownership because although it sticks to the traditional values, it does imply freedom in choice and one's ownership. 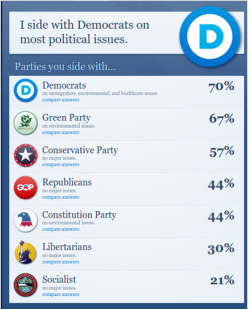 Overall, I'm a "very liberal" democrat. I'm on the verrrrryyyy left side (no specific percentage indicated). It matched up to my qualities. I'm young, a female, Asian, and a Buddhist -- so I lean towards the liberal side. I was very happy that I didn't end up on the republican side. 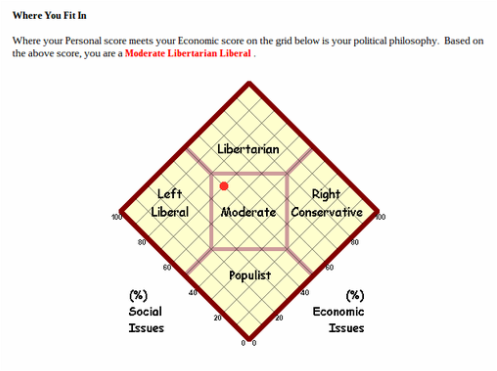 And I'm satisfied that my ideals match up to where I place on the political spectrum.